Mansfield Town’s players have recently been feeling the benefits from local gym CrossFit 17, in an effort to further enhance their strength and conditioning. CrossFit 17 is Mansfield’s largest strength and conditioning gym and welcomes people from all walks of life. Their equipment helps aid functional movements that mimic the way we would move in everyday activities without using restrictive machines found in modern gyms. 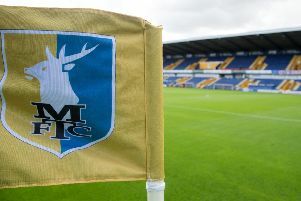 Stags’ boss Adam Murray says that taking part in CrossFit will help his side with the physical demands of their Sky Bet League Two season. “They have been brilliant,” he said “We started using CrossFit in pre-season; it’s an excellent local facility that has provided the football club, and especially our fitness department, with a great arena and facility to carry out specific strength and conditioning work on our squad which is continuously helping with our fitness regime and rehabilitation. “It is only two minutes from the ground so is very efficient for us and the guys at the gym have made us feel very welcome and it’ll play a big part in our season. “The equipment they have and the venue they have allows me, DT (Daryl Thompson, strength and conditioning coach) and the medical staff to employ some real power and conditioning sessions for the boys. “The boys don’t like it but they know the benefits of it after. It’s another part of this group that the longer things goes on, the better it’s going to get and the stronger it’s going to get, the more it’s going to grow. Murray is delighted to have a break from midweek matches for three weeks, saying “It’s good to get on the training ground. “The lads probably want to play games because they are getting better on the training ground. That’s not just physically, that’s tactically. I think you know how I work – I go into a lot of detail. The boys will be working morning and afternoon and they will get overloaded. “The other departments, the sports science and medical departments, are working just as hard and they are a great job at the minute. Any person of any ability can take part in CrossFit, as they scale the workouts to suit people of all ages and abilities; they say the biggest step is walking through the doors. Julia Crone, part of the team at CrossFit 17 said: “The classes are community-based, everybody knows each other’s names and there’s a real camaraderie amongst the people taking part in the activities. They are open from 6am-8.30pm and there are a range of membership packages currently available at CrossFit 17, with prices starting from as little as £2.50 per session. Each class is 60 minutes long and includes a dynamic warm up, skills/strength practice, WOD (Workout of the Day) and cool down and stretching. CrossFit builds good muscular endurance and all-round fitness – your body is prepared for pretty much any athletic situation after just a few months of CrossFit 17 training. For people who have never tried CrossFit before, taster sessions are available on specified days each week at a cost of £5 per session. If you want to book onto one of CrossFit17’s taster sessions please contact Craig on 078544 36121 or Julia on 075452 59454. CrossFit 17 is located in Mansfield, Unit 20 Kings Mill Way, Hermitage Lane Ind. Est. Nottinghamshire NG18 5ER.